1. How many users will be online? 2. What do you do online? 3. Would you like Telephone Service? 2. What do you or your family members do online? *Inclusive of taxes, fees, and service charges. *New Broadband members only. Offer expires 4/30/2019. 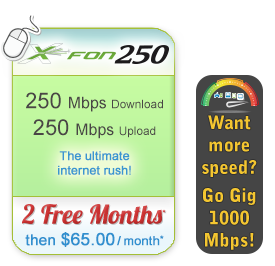 Price of X-FON 250 after the promo period can be as low as $50.00/month bundled with MCC Voice. Price of X-FON 1,000 after the promo period can be as low as $100.00/month bundled with MCC Voice. MCC member account must be active and in good standing. Other restrictions may apply. Call for more details. MCC is an equal opportunity provider and employer. *Offer subject to change without notice. MCC reserves the right to cancel or change this offer at any time. Offer for both parties is only valid with a new Broadband service activation. Offer cannot be combined with any other promotion. Referred members may opt to take an introductory promotion. The new Broadband member must retain service for 90 days before credit or reward will be applied to the existing member’s account. One free month credit to the existing member will be of their current Broadband package at the time of referred member’s new activation. A member account can only be referred once. Some exclusions and certain restrictions may apply. MCC is an equal opportunity provider and employer. 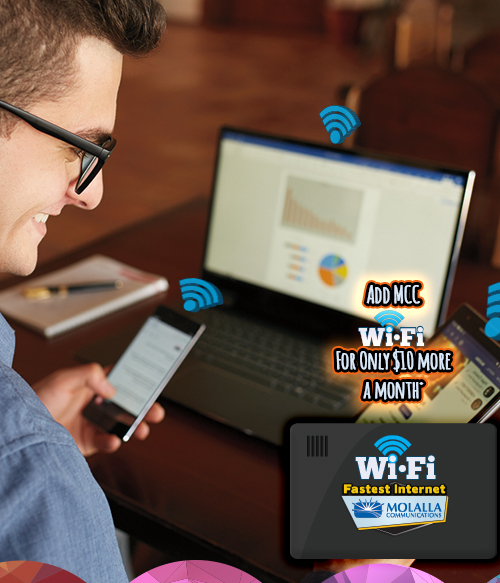 Want to add MCC Wi-Fi in your home or office? When you lease MCC's Wi-Fi router, programming, troubleshooting, repair, and replacement are included. MCC takes care of it. Now that's peace of mind! Call or visit MCC if you would like more information on how to Wi-Fi your home or office. Optional gateway lease - Customers may use their own gateway or lease a gateway from MCC for $10 a month. There is no term or commitment with Modem/Gateway lease. 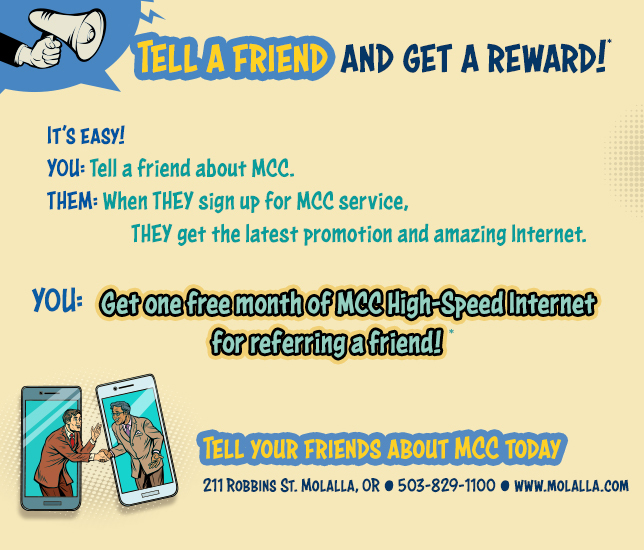 Gateway must be returned to MCC (211 Robbins Street Molalla, OR 97038) within 10 days of disconnection or customer will be billed a non-return of equipment fee of $150. Other restrictions may apply. Call for more details. MCC is an equal opportunity provider and employer. How do I watch on my TV? Click or scroll down below for information. 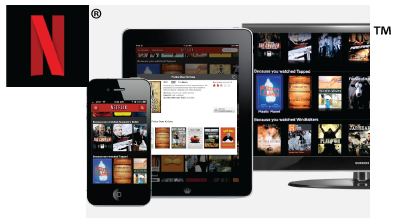 For an occasional movie you can rent and stream online! 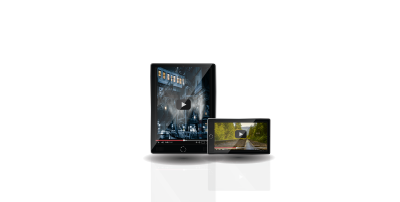 Network apps such as ABC, NBC, CW and others also have free content. How do I watch on my TV? Want to cancel cable and watch over the Internet? Here are some options to make your TV a “Smart TV”. Many modern video game consoles also serve as streaming players. Watch on these devices without any additional attachments. Getting started is easy. Or if you would like MCC to set up your device, call 503-829-1100 for a quote. *Provided for informational purposes only. Pricing and details subject to change. Netflix and related channels and service marks are a registered trademark of Netflix Inc or its affiliates. Amazon and related channels, programs and service marks are property of Amazon.com, Inc or its affiliates. Hulu and related channels and service marks are property of Hulu LLC. DirecTVnow and related channels and service marks are property of AT&T Corporation. HBO® and related channels and service marks are the property of Home Box Office, Inc. Sling TV and the Sling TV Logo are Licensed Trademarks of Sling TV LLC. YouTubeTV and related channels and service marks are property of YouTube, LLC. FuboTV and related channels and service marks are property © 2019 fuboTV Inc. PlaystationVue is copyrighted by Sony Interactive Entertainment LLC. FandangoNOW is a trademark of Fandango Media, LLC. VUDU and related channels and service marks are property of VUDU, Inc. Crackle and related channels are property of Sony Pictures Digital Productions Inc or its affiliates. All trademarks, company and product names are the property of their respective owners. 20190319. X-FON Internet - The Fastest Internet Available! 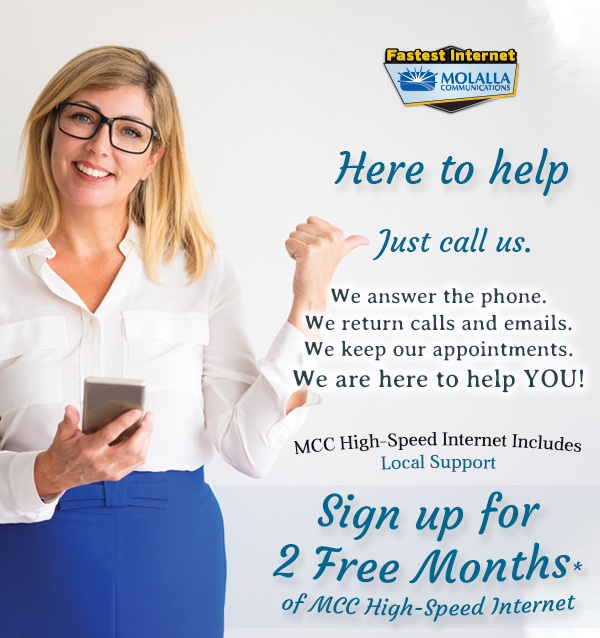 Molalla Communications has broadband speeds powered by our fiber optic network! Up to 1,000 Mbps of pure download speed, and up to 1,000 Mbps of incredible upload speeds! With X-FON you no longer need a modem. That means less setup, less clutter on your desk, and less to troubleshoot! Gigafication for maximum speed needs! Inclusive of taxes, fees, and service charges. Requires Adobe Reader to view - Click Here to download it for Free.